I’m doing a River Song. Certain stories are being told out of sequence. I usually post videos in the order I create them. Today’s an exception, largely for the hell of it. What’s the point in having a self-imposed rule if you can’t break it sometimes? This might, of course, explain why I’m still fat. Emily and I got home from the school quiz on Friday evening to discover the news that Chris Chibnall will shortly be replacing the departing Steven Moffat, after Moffat has produced series ten of Doctor Who – a series which has been delayed until 2017. I have my own views on this, which I’ll save for another day. If you want the Cliff Notes, here they are: a year off is probably going to do us all good. It’ll give me time to stop hating the direction the show has taken. I need breathing space. I need to watch the Sarah Jane Adventures with the kids. And goodness knows I ought to get that book finished. But talking of spin-offs, this revelation came hot on the heels of a video I’d uploaded only hours previously. It was one of those things we talked about back in December, when such a thing seemed obvious. A few days ago I had the germ of an idea. I Googled it. The results were minimal enough to convince me I could offer something of substance that wouldn’t look like everything else that people are doing. Alternative title sequences for Doctor Who are all over the internet. Have you seen the Friends one? There are several, but I like this one better than most of the others, largely because John Simm seems far more convincing as a slightly crazed Murdock goofball than he ever was as the Master. Still. You remember that series nine finale. 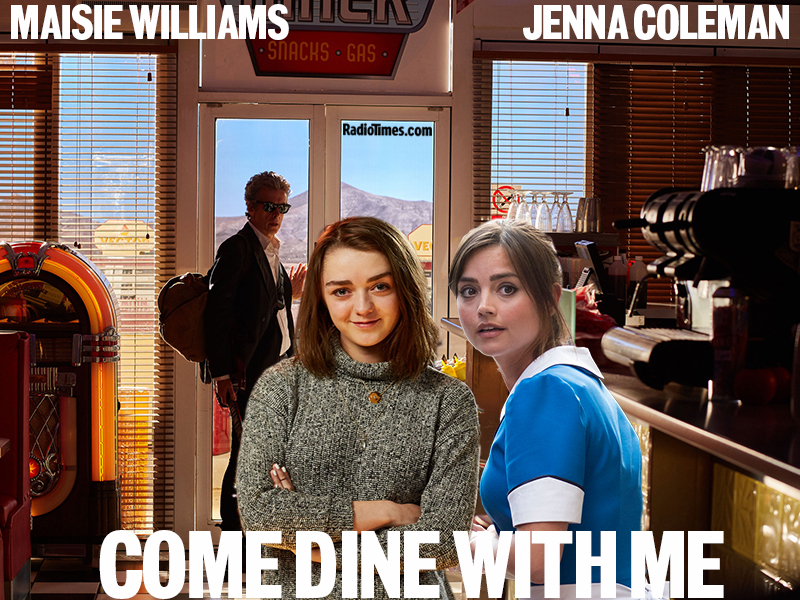 When Ashildr (I cannot and will not bring myself to refer to her as ‘Me’) and Clara nicked the TARDIS – now permanently disguised as an American diner, which presumably made it impossible to actually park the thing – and went off for centuries of adventuring? I mean, I hated it. I really did. Clara’s dead. She’s pecked to death by a giant bird in the middle of Diagon Alley. She’s already had more than enough adventuring for someone her age. Why does she get to have more? Can’t she leave some for the rest of us? But still the cries of ‘spin-off! spin-off!’ ran thick and fast. Never mind the fact that Jenna’s off to play Queen Victoria and Maisie Williams is presumably still knocking around in Game of Thrones (I wouldn’t know, I’ve never seen it). It doesn’t matter. The fan-fiction writers are, I’m sure, out in force and I daresay that a lot of it comes under the Rule 34 subheading. I mean, that’s good. I rather like that one. But you couldn’t possibly do a spin-off and not call it The Long Way Round, could you? It just seems such an obvious title. I can even forgive Moffat for using it twice. It works. The most difficult part of this was finding music that worked. There is a decent Stereophonics song entitled ‘The Long Way Round’ – used for a biking documentary that was quite popular over here – but stylistically it didn’t fit. A close contender was ‘End of the Line’, which was eventually ditched because a poor facsimile of the song has served to underpin the New Tricks titles for years, and it just felt a bit like cheating. I consulted a Facebook group of which I’m a member. They were helpful, although I didn’t employ any of their suggestions. The idea of using ‘Sisters Are Doin’ It For Themselves’ was one I feared would be fraught with difficulties until I discovered the 12-inch version. There was a lot of copy-and-pasting, and if you listen carefully you can hear the joins. The trick is to use as many different outfits and contexts as possible. Coming up with a variation for Ashildr turned out to be easier than I thought, even though she only appears in four episodes. There’s understandably very little footage of her and Clara together, which is why I spliced a scene from ‘Cold War’ with the ending of ‘The Woman Who Lived’, in one of those things that’s so bad that people will hopefully just assume I was being artistic. The opening dialogue is a composite of Clara’s monologue at the beginning of ‘The Name Of The Doctor’ and various things she said in ‘Hell Bent’. Overall, this straddles a fine line between Life on Mars and Cagney and Lacey, purposely emulating the former. In that respect, it works. You don’t see the Doctor at all, and that’s entirely deliberate. Someone else mentioned they’d like Jenny to be on board, and while I don’t think the TARDIS is quite that big, she could be a recurring character. She could pop in every series and slide under lasers or something, and then bounce off again. Or they could do a series finale where she goes all veiny and evil. I’d kind of like to see that one. Oh, and that quiz I mentioned? We won. And there wasn’t a single Doctor Who question. Some days, you just throw a double six. Congratulations on your quiz win, and for making a fake trailer look like something I’d actually enjoy watching. I’m – so – over the ‘Impossible Girl’ story arc, and yet you made this trailer seem like a nice ‘fun’ programme with much of the fake angst removed. Well done! Big Finish will almost certainly release something like this, a few years down the track.